Perfect weather, a fantastic challenging course, beautiful riding and driving conditions and lots of success combined to make Flowerhill 2015 a vintage renewal of the best loved event on the calendar. Congratulations to Denis and Dawn on their 3rd place in the AP Pairs, to Leo and Marina who landed the prized red rosette in the Intermediate Pairs, to Anne and Keary who took the green ribbon in the same class, and to Francis, who after a challenging round in the Pairs swooped to take second place in the ultra-competitive Intermediate Championship. Hot on his heels came new member Shauna Boyle in joint 4th place. Well done everybody who won or placed, and well done everybody who competed. You brought great credit to the club. A gazillion thanks to Marina for yet again ensuring that we had our usual quarters on site. It just wouldn’t be the same any other way and Marina’s promptness each year in booking stables is the key to our enjoyment of the whole expedition. A gazillion thanks too to Ann for organising such a wonderful volunteer rota that allowed the riders to concentrate entirely on enjoying the riding, and for herself (and Keary) for shouldering a substantial part of the workload. Thanks to all the club’s foot soldiers for helping out with the volunteering, with the horses, with the camping, and with the craic. And thanks for support on the course — there may not be time for the riders to acknowledge the roars as they pass but they really do give a great lift. Smiles and laughter say it all! Thanks to Anne for sending on the photo. See the rest of them in the Gallery. The fondness with which Flowerhill is regarded amongst the Donegal riding clubs was more evident than ever this past weekend. 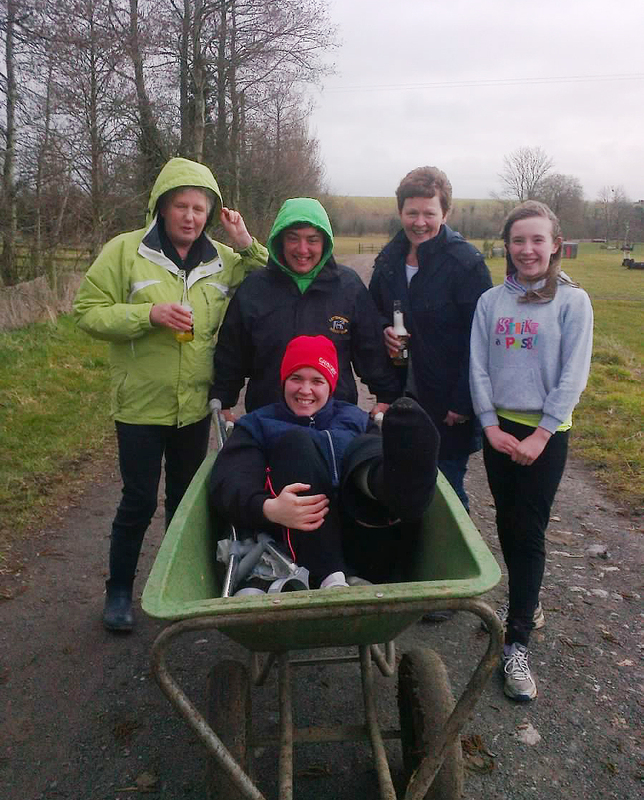 Half the county’s members descended on the sprawling Galway estate near Portumna to enjoy the hospitality of its ever-welcoming and energetic owner, Oliver. The first competition of the weekend began around 10am on Saturday at various points dotted around east Donegal. 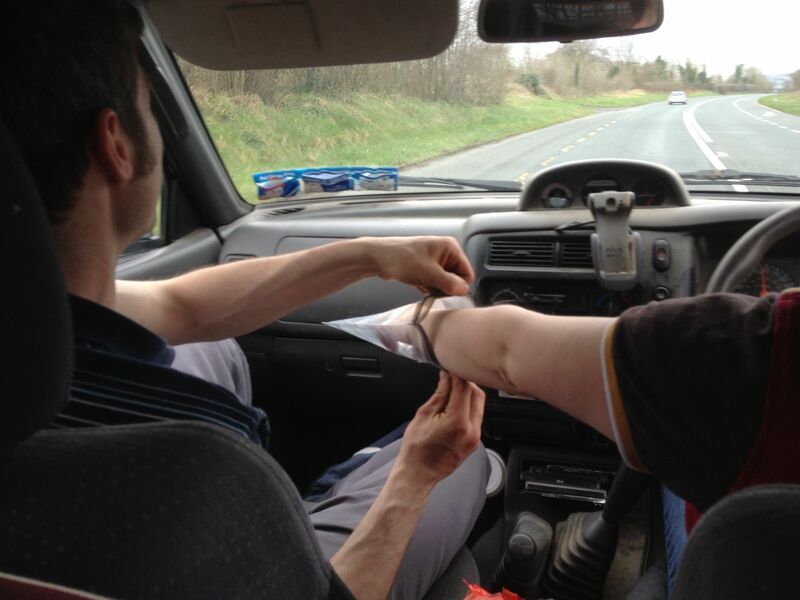 There was a near-perfect convergence of vehicles just south of Ballybofey with Damien and Francis in the vanguard. Not for the first time did Marina and Damien take each other on, this time in a relentless slow-motion race south. Marina, tired of annually arriving Paddy last and having to squeeze her sizeable horses into the last crack in the stable walls, had evidently sent Enda out for a winter course of lorry driving and he delivered spectacularly on the day. The big St Johnston lorry pulled victoriously into Flowerhill marginally ahead of the gallant red van with its super-sized load of custom-built 4-legged cross-country machines. Entertainment on the journey included a Physical & Spritual Flowerhill Travellers Sweepstake on the Grand National. Evidence is provided below of the scrupulously fair drawing of the horses. All insinuations of trickery and skullduggery are being vehemently denied by the organisers. Maura was the lucky winner of the winner-takes-all pot. With horses comfortably installed in familiar quarters, tents pitched and carefully stowed in trailers and lorries, man and beast properly fed, the real entertainment was cooking up nicely in the large informal kitchen of the hospitable house. The only thing more impressive than the extraordinary number of Donegal club members gathered in a room in Galway was the same group’s phenomenal production of homemade alcoholic beverages. There were several suspiciously unlabelled bottles from a bona fide brewery on the Fanad peninsula, fine turnip wine and its sibling, turnip poitin, from the wildest west of the county, a truly remarkable sloe gin from Burt direction, and a memorable brandy-ball liquer from the banks of the Finn. Together they contributed to a hell of an atmosphere and there was little residual damage when things got earnest on Sunday morning. Rain came down early in the day but it quickly cleared to a bright and breezy day. The ground was softer than we’re used to in Flowerhill but that was no deterrent to Donegal horses. In the usual sequence, the starter dispatched the Pairs and then the Individuals at each grade. Refusals, run-outs, navigational crises and the odd topple off (too much turnip wine?) were a feature of the Pairs classes but Anne and Keary were in top form and claimed a famous victory at Intermediate level on Molly and Arthur. Huge congratulations to you both. Damien and Francis squeaked in for fifth spot and some ribbons to shorten the journey home. Otherwise the day was fruitless in ribbon terms but the yield of smiles, laughter and exhilaration hit its usual peak. Nobody goes to Flowerhill expecting to win. The Gaeltachts brought home their usual fine quota of rosettes and it was particularly thrilling to see Liz Potter and Clyde finish a brilliant fourth in the Advanced Primary Championship. Not too long ago Liz wouldn’t have dreamed she would ever have the courage to ride at Flowerhill. Quite an achievement! Three Inishowen riders made the club’s first foray to the magical destination and they surely won’t be the last. A very, very big thanks to Marina for organising all our stables and to Kelly and Jade for their hours of fence-stewarding. Let’s hope they don’t grow up to riding club age for a good while yet. 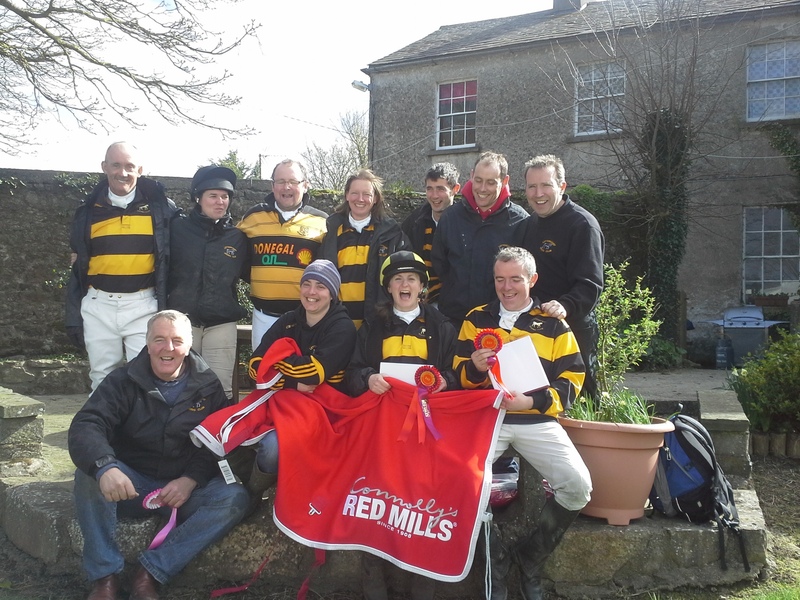 Congratulations to all our competitors, particularly to Anne and Keary, and to Denis and Christopher who rode superbly and entertainingly on their first assault on Flowerhill. Respect to Teldel who powered around the course like a juvenile at the ripe old age of 24. Sympathy to Anne and Damien who completed their individual rounds on zero scores yet missed out on placings purely by fate and a whisker. Hats off to Leo and Dawn who completed masterful clear rounds on inexperienced youngsters. Finally, thanks to our valiant foot soldiers, led by Louise, Linda and Dympna and bolstered by the younger generation. Full results are up on the AIRC website and photographs can be seen on the Equestrian Photographic Services site. The Letterkenny colours are as easy to spot as ever. Great colours for a great club. Pictured below: The Sweepstake Draw. If there are any more photos out there, send them on! This annual event draws a huge crowd and is immensely popular. This year it runs as a non-registered event, making it more accessible than ever before. Bob and Mary Barrons at Templemore are always very supportive of our club activities so don’t be shy about turning out for their big day on Monday 17 March, beginning at 9am. 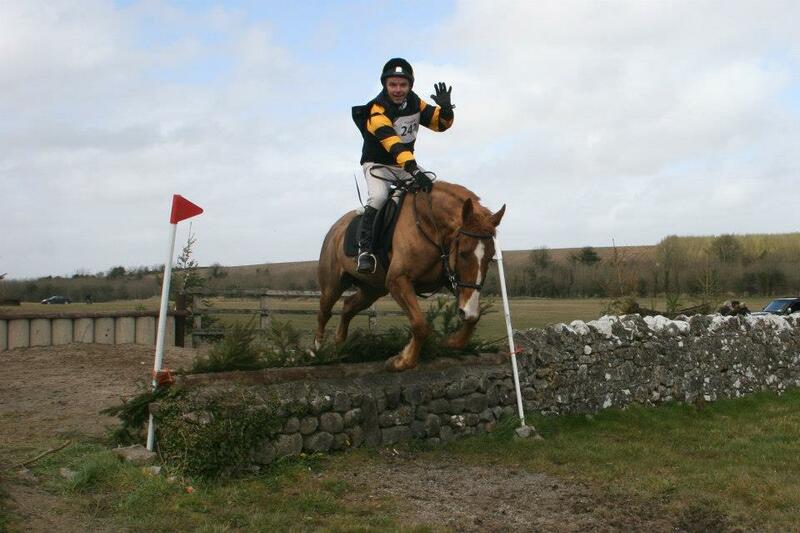 Many of our members are familiar with the wonderful all-weather cross country course near Cootehill in Cavan, home of the ever-popular Drumlin Harriers Hunter Trials. This year’s hunter trials take place the weekend after Flowerhill on Sunday 13 April. Those of you who prefer top experience the amenities at a steadier pace and who might appreciate a school before Flowerhill should consider the Trec event on Sunday 30 March. Full details on the Donegal Trec website. Christmas has come and gone and we’re already firmly rooted in the new year with sights set on a full 12 months of equestrian activity. Horses and riders might be a bit rusty after weeks of the festive season and generally truly atrocious weather conditions but there’s lots to look forward to. To get up and going again for 2014 we’re having a general club meeting on Friday 10 January at Tir na nOg. Everybody is welcome and we hope to plan a good active calendar for the next three months or so. The early part of the year will be dominated by the Northwest Spring League which falls on its regular dates throughout February and March. The first show takes place on Sunday 9 February. There’s a meeting of the Donegal clubs this coming Tuesday evening, 7 January, to firm up plans for the league and to reflect on activities in the final months of 2013. With all this competitive action in prospect, we’re running a series of jumping lessons with Kelda on Fridays 17, 24 and 31 January at Templemore. The intention is to keep Primary and Advanced Primary riders together in the 7pm group with Intermediate and above riders filling the later spot. Contact Cormac to book your place. Looking further ahead to Flowerhill on Sunday 6 April, top marks must go to Marina for booking stables on site in record time. She has 12 stables reserved and you should contact her as soon as possible to lay claim to one of them if you plan to travel to this unmissable event. Do your best to get to our meeting on Friday next, 10 January, and we’ll set the tone for an active, enjoyable and rewarding season. See you all there. **Finally a reminder that you may not participate in any mounted club activities until your 2014 membership is processed. This takes about a week after your subscription payment to Francis or Cormac. So, if you plan on doing the jumping lessons with Kelda, this Friday’s meeting is your cut-off for renewing. If it weren’t for Liz Potter’s thoughtfulness, we’d have no record of Gurteen at all! Enjoy her images in the Gallery. Pictured below: Keary — ever the crowd pleaser! No ribbons but otherwise all reports of the National Hunter Trials indicate that the event was a big success. Enda and Pauric had a great clear round in the Advanced Primary Pairs but their time prevented them from making the placings. The optimum time for AIRC hunter trials will have us all scratching our heads to the grave. There appears to be little or no consistency from year to year but doubtless a range of factors — from the condition of the ground to the style of the track — combine in some miraculous formula to determine the exact figure for each championship. Damien was the only one of our Intermediate riders to chalk up a clear round but, again, his time was sufficiently wide of the mark to keep him out of the ribbons. It was left to the Gaeltachts to bring home Donegal’s 2013 quota of rosettes with John McDaid finishing 6th in the Advanced Intermediate class and the hair-raisers, Sally Mahon and Laura Schneider, placing in both the Mixed Pairs and their respective individual classes. 2013. Another year down. It’s a credit to the county that we send participants in such numbers to this distant championship. Any of the regulars who missed it this year will be the first to tell you why it’s such an enduringly popular event. As Enda’s chef d’equipe, there was no way Marina wasn’t walking the course at Gurteen… Good to see that the driver isn’t drinking! It’s the middle of April. Club members are this morning packing the last remnants of tack, clothing and provisions as they ready themselves for the road to Gurteen. The sat-navs need a slight readjustment after six years of pointing steadfastly towards Flowerhill but otherwise little is different in 2013. Damien, Francis, Enda, Anne, Keary, Pauric, Leo and possibly Claire are heading down the road to compete for ribbons, glory and, above all, the sheer thrill of bowling around a good cross country course. They’ll be joined by friends and rivals from the Gaeltacht and Tirconaill. Inishowen are sadly missing after Kate MacPherson’s horse injured himself shortly before the event. Happily the pair will be back in action shortly. There’s no shortage of support for the riders. We mightn’t match the sheer numbers who made the trip last year but with Audrey, Louise, Christopher and Maura leading the cheers, the club will have an unmistakeable voice. The very, very best of luck to everybody. Have fun, come home safely, and make sure you bring some ribbons! Time to start thinking in earnest about the annual April pilgrimmage! Full details for the AIRC National Hunter Trials at Gurteen College are available on the AIRC website. Postal entries close on Thursday 28 March while online entries open on Friday 29 March and close at 3pm on Friday 4 April.